Many people have ideas about what is the best way to roast a chicken. In her book “The Art of Simple Food”, Alice Waters suggests seasoning the bird with salt and pepper up to two days before you roast it. Others suggest leaving the skin exposed in the refrigerator for many hours before roasting so it will be crispy and stuffing the cavity chock full of fresh herbs, onions, and citrus, and roasting at high temperature for the first 20 or so minutes. Alice also suggests that the rule of thumb should be 20 minutes breast up, 20 minutes breast down, then 20 more minutes back up again to make sure the entire bird is evenly cooked and crispy. That 20 20 20 idea is based on a 3 1/2-4 pound bird cooked at 400 F.
Neil and I love to devour a roast chicken. I usually buy the biggest one I can get with the idea that there will be left overs, but that rarely happens. The key to making a good roast chickens starts with the chicken. It really is worth it to by a chicken from a farm not a factory, if for no other reason than it tastes better. A local organic chicken bought at Whole Foods usually costs around $14 for a 3 pounder (more or less). Buying it from a farmer or from Heritage foods will probably cost you more. The Poulet Rouge pictured above was 4 1/2 pounds and sold for a whopping $7 a pound so ladies and gentleman what you are looking at is a 31 buck bird. Yikes. It is considered to be the tastiest bird around and this one had a nice life on a real farm not so far from our house. It’s rare that I find such a bird at a local market so I decided it was worth the splurge. This particular bird was not treated to any fancy treatment, no 2 days of salt and pepper no air drying. I salted and peppered it inside and out and stuffed it with fresh rosemary, shallots, onions and lemon. I used Alice’s 20 20 20 scheme this time around but have to say I prefer my traditional method. I usually cook the bird at high heat 500 F for 25 -30 minutes, turn the heart down to 400 F and cook it for about 45 minutes depending on the size of the bird. You want the liquids to run clear when you pierce the skin and a meat thermometer should read 165 F when plunged into the thickest part of the breast. This has always been a very successful method for me, the skin is crispy, the meat is not dry and it doesn’t require any pre-thinking or fuss. Its so foolproof that its just about the only cooking Neil ever does when I’m not at home to feed him. I do try to get the bird to room temperature before I put it in the oven, but I don’t always succeed. I also dry it off with a paper towel before preparing it. 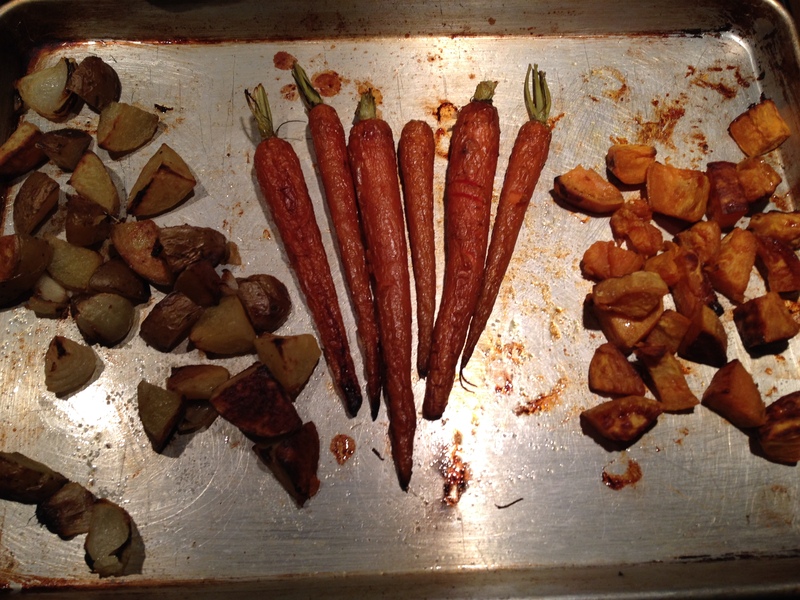 After the first half hour of cooking I threw into the oven some root vegetables that I had in the fridge. A very easy tasty meal that requires little skill and can be whipped up with less than 10 minutes of prep. In this particular iteration I added some left over onion wedges to the potatoes when I roasted them – easy to do and I thought they rendered a very tasty variation on roasted potatoes. Of course it never hurts add garlic before cooking and tossing the roasted vegetables with fresh thyme, rosemary or tarragon and salt when they are cooked (but salt is essential). 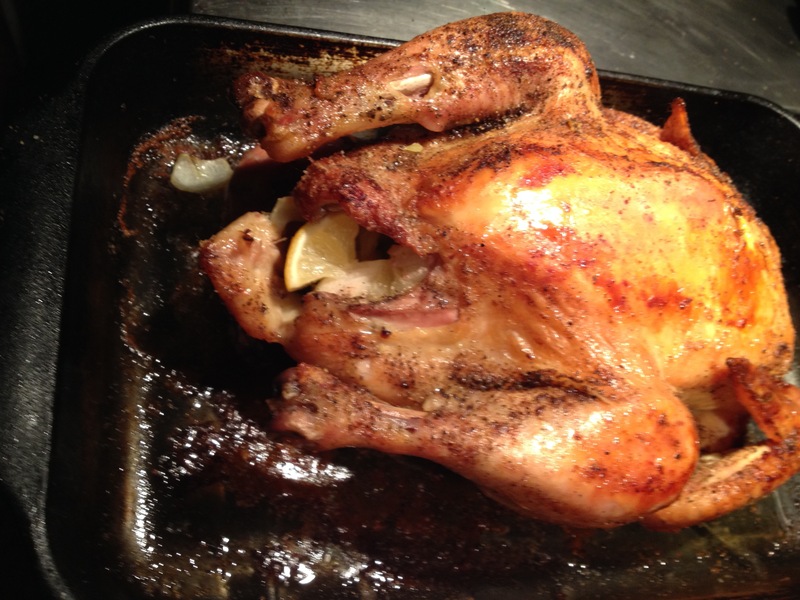 This entry was posted in Recipes and tagged farm raised meat, heritage foods, poulet rouge, Roast Chicken, roast vegetables. Bookmark the permalink.